On Nov. 8, California Acting Governor Gavin Newsom declared a state of emergency in Los Angeles and Ventura Counties due to the Hill and Woolsey fires. We remind affected consumers to beware of being overcharged and businesses to avoid violating price gouging laws. When a government body (e.g. President, Governor, mayor, County Board of Supervisors) declares an emergency, businesses cannot increase the price of goods and services more than 10 percent for 30 days in most cases. This protection extends for 180 days for any contractor-related services. If you think a business is breaking the law, save your receipts and contact us at 800.593.8222. 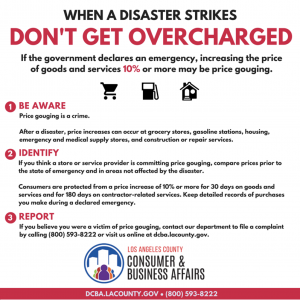 Los Angeles County has additional price gouging laws to protect consumers after a disaster. For the latest updates on emergency efforts across Los Angeles County, please visit lacounty.gov/emergency. For more information on price gouging, check out our tip sheet and infographics. You may be contacted by someone known as a public insurance adjuster. Public insurance adjusters do not work for your insurance company. You can hire them to work on your behalf and help you negotiate a settlement with your insurance company. They usually charge a fee of 10% of the insurance claim proceeds you receive. If you choose to hire a public insurance adjuster, then you should do your homework to select the right one. They must be licensed by the California Department of Insurance and have a bond. Check their references and ask about their work experience. For more information, contact the Department of Insurance at 800.927.4357 or check their online database. Contractors in California must be licensed if they charge you $500 or more for repairs. Contact the Contractors State License Board at 800.321.2752 to find out if a contractor has a valid license, or if people have complained against them. After a disaster, do not be rushed or pushed into signing a contract for repairs. Before you choose a contractor, get several bids, and make sure all verbal promises are in the written contract, including materials to be used, costs, and the completion dates. If the total cost for materials and labor is $500 or more, the contractor can charge you a down payment of only $1,000 or 10% of the total cost, whichever is lowest. Do not make the final payment until the contractor completes the work, pays his workers, and the city inspectors approve the work. Beware of telemarketers, door-to-door salespeople, and junk e-mails asking for donations to bogus disaster charities. Many bogus charities use names that sound like the real ones. Don’t be fooled. Give only to charities you know. Avoid people who will not give you their name, phone number, or written materials. Never give money to people sent to your home to pick up cash. Be also suspicious of out-of-state groups, especially if their only address is a P.O. Box. Contact the Attorney General’s Office Charity Registration at 800.952.5225 to find out if a charity is real. Moving companies must be licensed by the Bureau of Electronic and Appliance Repair, Home Furnishings and Thermal Insulation. Before you hire a moving company, visit www.bearhfti.ca.gov or call (916) 999-2041 to check whether the company has a valid license, or if people have complained against them. Bogus firms may try to get you to buy expensive, useless water filters. They offer to test your water for free and claim your water is bad. Don’t be fooled. Contact your water company or the County Environmental Health Department to find out if your water is bad. The water company’s number is on their monthly bill. Contact the Department of Environmental Health at 888.700.9995. If you rent a home or an apartment and your place is badly damaged in a disaster, you can move out right away. You do not have to give your landlord advance notice, and you have the right to get back your security deposit and last month’s rent. Your landlord has to send you this money within three weeks after you move out. For help or information, contact us at 800.593.8222. The Bureau of Real Estate must license companies that charge you in advance to find you a place to live. Contact the Bureau of Real Estate at 877.373.4542 to check whether a company has a valid license, or find out if people have complained against them. Be aware that many companies charge for rental listings that are old or don’t exist. The company must give you a written contract. Read and understand the contract before you sign it. Following a disaster, you might need a quick loan to rebuild your home or business. Don’t be tempted by offers of “guaranteed” loans that require costly advance fees in order to get them. If you use one of these companies, you may never get a loan or see your money again. Protect yourself. Deal only with licensed lenders. Following a disaster, you may be entitled to get a loan from the U.S. Small Business Administration. For more information, call 800.827.5722. If a person sells you something at your home for $25 or more, you have the right to cancel the contract within three days and get a full refund. The salesperson must tell you of your 3-day right to cancel and give you a cancellation form. You can cancel for any reason, but you must do it in writing. Make sure you mail your cancellation notice before your right to cancel expires. To protect yourself, send the cancellation notice by certified mail and ask the Post Office for a return receipt.